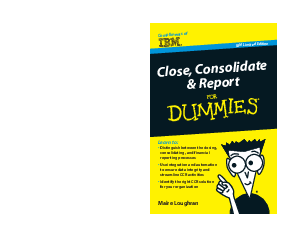 Welcome to Close, Consolidate & Report For Dummies, IBM Limited Edition. Use this book to understand why integrating and unifying your closing, consolidating, and reporting process is critical. Learn about re-engineering your point solution approach to these activities by investing in integrated solutions. Achieve automation and enhance your ability to manage internal controls, reduce risks, and efficiently create consolidated financial statements and regulatory reports (including XBRL). With this book, you find out how a unified CCR process gives leaders timely and accurate insights to make smarter decisions. You also discover features of the ideal CCR solution and learn what to look for in the selection process. And, you'll come to understand the close/consolidate/report process and how integrated CCR solutions enhance internal controls and provide better insight into business performance. You also find out about optimizing financial and regulatory reporting by providing business leaders and stakeholders with a better understanding of business performance through meaningful financial data and disclosure.